Press Activity - Save Earl's Court! Police arrived at Edelman's London offices on Wednesday when a group of campaigners, including Hammersmith MP Andy Slaughter, were barred from entering the building to deliver a petition to the firm's public affairs MD Chris Rumfitt. The Save Earls Court, West Kensington and Gibbs Green estates group, which is campaigning against the redevelopment of Earls Court and surrounding areas, told PRWeek that Edelman's office block was locked, preventing people from entering or exiting the building. 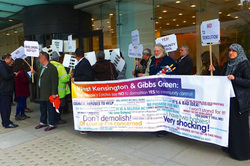 Chair of West Ken & Gibbs Green Community Homes, Keith Drew claimed that workers from other companies in the same office block were also affected. Rumfitt denied that Edelman had any involvement in the decision to lock the doors of the shared building. Police arrived at the scene as Slaughter exchanged text messages with Rumfitt asking him to meet campaigners, which he then did. Rumfitt added that Edelman did not call the police about the matter. Drew contended that Edelman ‘trumpets its international awards and boasts an 'Edelman Trust Barometer'. Yet, when a few council tenants tried to deliver a letter to its managing director of public affairs for London, he locked down a major headquarters building in the heart of the capital’. This is an allegation Rumfitt denies. Earlier in the day, the group which includes tenants of the West Kensington and Gibb's Green estate and other local residents, handed the petition to the Department for Communities and Local Government, Capco and TFL, which is a partner in the development. 'Localism in action' say residents who hand over petition to save homes. FEARFUL of losing their homes, residents have handed over a 1,000-signature petition to the Government against the redevelopment of Earls Court. In a coordinated programme of protests, residents of the West Kensington and Gibbs Green Estates first visited the Victoria headquarters of the Department for Communities and Local Government to hand in their petition to Secretary of State Eric Pickles. They then visited the Mayfair headquarters of developers Capco; the firm's PR consultants, Endelman; Transport for London; and planning consultants DP9, unfurling banners and singing songs of opposition. MP Andy Slaughter joined the tour and demanded a meeting with Capco officials, while staff from both TfL, who are set to sell their Lillie Road bus depot as part of the redevelopment, and Endleman were forced out of their offices to pacify the determined yet peaceful group. Community organiser Jonathan Rosenberg hailed the day as a success and said it sent a clear message to the Government and the developers that residents will not give up their fight to save the estates' 800 homes from bulldozers, earmarked to be replaced with thousands of luxury flats and amenities. He said: "This is showing the Government the majority of people do not want this. This is the Big Society, this is localism and people standing up and saying 'no' to the destruction of their community. We have got momentum and even had passers-by in Mayfair joining our protests." Mr Pickles is set to make a decision on whether to approve both Hammersmith and Fulham and Kensington and Chelsea Council's decision to sell their land in the coming days. Keith Drew, chairman of the West Kensington and Gibbs Green Housing Association, urged the minister to come and see the estates for himself before a ruling is made on their future. "They are not dilapidated," he said, "They are not in a state of disrepair. If they were, we'd say, 'Knock them down' but there is nothing wrong with them." A spokesman for Capco said: "We respect the right of this group of the West Kensington and Gibbs Green estates to protest. Over the past five years we have engaged widely with the local community and have seen both opposition and support for the development. We believe that Sir Terry Farrells consented masterplan will bring enormous benefits to London and the local area, creating 7,500 new homes and 12,000 new jobs. We have regularly invited members of the TRA to discuss their point of view in the past and we were pleased they accepted our offer today to meet with us during their protest. We look forward to continuing this dialogue in the future." Mayor Boris Johnson is set to look at the overall scheme in the coming weeks, while the protesters are battling to get the project taken to the High Court. Residents of homes threatened with eviction to turn them into luxury flats staged a series of flashmobs today across London. Campaigners travelled by coach to the addresses of those responsible for the planned luxury development, which will see the destruction of West Kensington and Gibbs Green Estates, and also Earl's Court exhibition centres. Activists held flashmobs inside buildings including the Department of Communities and Local Government, Transport for London, developers CapCo, planners DP9 and PR company for the project Edelman. They distributed leaflets and copies of the petition against the plans and unfurled a 50-foot scroll of the petition already containing thousands of signatories. The protests led to the lockdown of Edelman's premises in Victoria Street to stop anyone getting into the building. RMT's London Underground engineering branch chairman Andy Littlechild highlighted that Lillie Bridge Depot is also under threat and warned of the massive impact on jobs for those employed at the depot and exhibition centres. Hammersmith Labour MP Andy Slaughter expressed his disappointment in the local council and its councillors for doing nothing to stop the demolition, which he said would "destroy an entire community" with the loss of homes and arts centres in the name of profit. Communities and Local Government Secretary Eric Pickles is expected to make a decision on whether or not to allow the plans to go ahead in the next few days. Losing Earls Court would be a huge set back for the London and UK economy. Earls Court brings in £1 billion a year, provides a shop window for UK industries and sustains thousands of long-term jobs in the local area. This economic benefit cannot and will not be replaced by a one-off construction project. The Mayor has just returned from a trip to India trying to attract investment into London. Yet, within the next month or two he may remove one of London’s best shop windows for promoting national industries. Boris Johnson instigated the redevelopment of Earls Court by designating it an Opportunity Area. As Chair of Transport for London he owns the land and as Mayor he is currently due to make the final decision on the planning application. There is no evidence that London needs less exhibition space. Britain’s competitors are currently expanding their own capacity because they understand the economic benefits these centres create. If the Mayor allows this proposal to go ahead he will be losing a £1 billion a year contribution to the economy and will be damaging the UK’s economic competitiveness. The plan to demolish Earls Court Exhibition Centre in West London was approved on Tuesday 20th November by members of Kensington and Chelsea’s planning committee, following on from Hammersmith and Fulham council’s approval on 12th September. Plans to demolish the Earls Court exhibition centre in west London will leave the city short of large-scale exhibition space and undermine the commercial opportunities generated by the Olympics, event organisers have warned. The city’s second largest events centre is to be flattened to make way for 7,500 flats, shops and offices as part of an £8bn scheme by architect Sir Terry Farrell. Plans for the 77-acre site, which straddles two local authorities, were approved by Kensington and Chelsea council in November, after Hammersmith and Fulham gave its go-ahead in September. A new action group has been established in a bid to derail the redevelopment of Earls Court. The Earls Court Area Action Group is being coordinated by local councillor and chairwoman of the Nevern Square Conservation Residents’ Association Linda Wade, and comes a week after the Royal Borough of Kensington and Chelsea (RBKC) approved redevelopment of the Earls Court Opportunity Area, including demolition of Earls Court’s two exhibition centres. Kensington and Chelsea approved the destruction of the Earls Court centre last week, nodding through the part of the wider Earls Court project plans that falls into its domain and bringing joy to almost no one except the developer Capco, neighbouring Tories in Hammersmith and Fulham (H&F) and Tory London mayor Boris Johnson, who is less likely to use his mayoral powers to impede the project's progress than Queens Park Rangers are to win the Premier League. Almost everyone else is fed up, unless you count those overseas investors who see London as a safe spot to park their surplus millions and who, it would appear, are already being wooed for an "off-plan" purchase spree. Earls Court ward Lib Dem councillor Linda Wade, who also chairs the Nevern Square Conservation Area Residents' Association, has written to me underlining the argument that the loss of the exhibition centres – the Thirties-vintage Earls Court 1 and the much newer Earls Court 2, which will also go - will alter the identity of the area and doom businesses that depend on them for trade. "The density, scale and massing are out of character and context with the existing buildings in height and architecture," she says, a view much in line with the conclusions of the design review panel (see via here) the two boroughs themselves commissioned. They too have cut no ice. 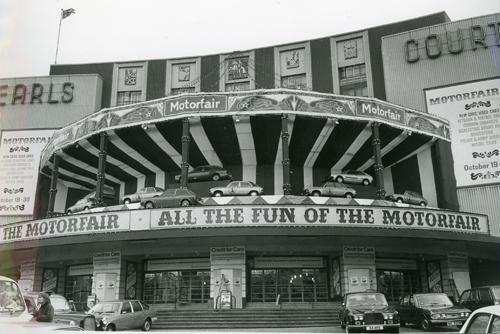 West Ken & Gibbs Green Estates have an excellent archive of stories relating to the demolition of both the Earl's Court Exhibition Centres and the West Kensington & Gibbs Green Estates. Visit their archive here.